Calvary Assembly of God was founded in June 1954 as an Assemblies of God Church. The Assemblies of God is the world’s largest Pentecostal denomination with over 67 million members worldwide. 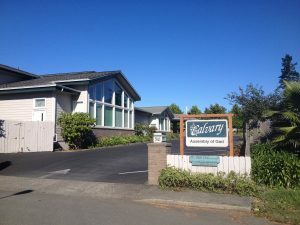 As an Assemblies of God Church and member of the Oregon Ministry Network, Calvary follows the Four Core Beliefs: Salvation, Baptism in the Holy Spirit, Divine Healing, and The Second Coming of Christ. In 1977, Pastor Adrian Van Aswegen was called to serve at the church. Back then, the church was a simple wooden building without any employees except Pastor Adrian. In 1995, the entire church burned to the ground. From the ashes came the current church. Classrooms and gathering areas were added. In 2008, the church expanded again to add another gathering area for bible study and small events. But through all the expansions, two things never changed: The message about Jesus Christ and the small church feeling. Everyone is welcome to hear about the glory of the Lord. For over 40 years, Pastor Adrian has ministered at Calvary Assembly of God. His view that all are loved by Jesus inspires others to improve themselves through Jesus. Read more about Pastor Adrian on his Welcome Page. New to our church in 2017 is Youth Pastor Jarred Harding. He comes from Life Church Assemblies of God in Kimberley, South Africa. We are excited to have his energy and commitment to the Lord to minister to our Youth.